When choosing a wood- or pellet-burning appliance, it’s important to select one that’s properly sized for the space to be heated. When an appliance is too big, residents tend to burn fires at a low smolder to avoid overheating, which wastes fuel and is one of the biggest causes of air pollution. An under-sized unit will not provide sufficient heat. You should discuss your heating needs with a reputable dealer. 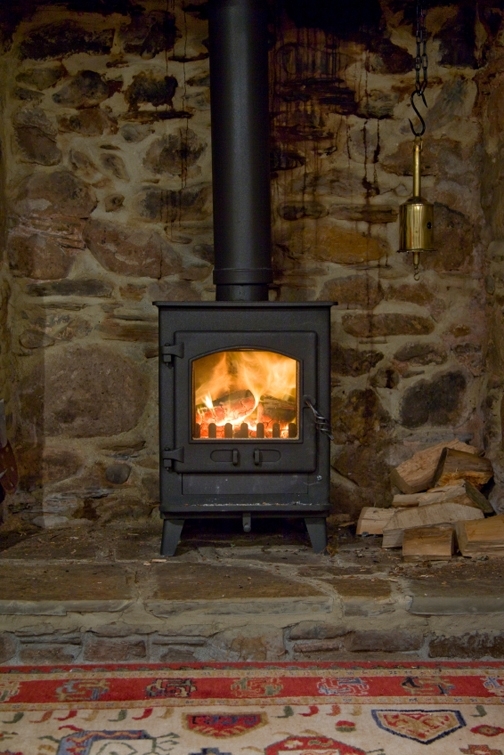 A good rule-of-thumb is that a stove rated at 60,000 British Thermal Units (Btu) can heat a 2,000-square-foot home, while a stove rated at 42,000 Btu can heat a 1,300-square-foot space. Flues leak heated and warm air out of your home. If you have a fireplace that you don’t use, plug and seal the flue. If you use the fireplace, be sure to close the flue when the fireplace is not in use. You could also use an inflatable stopper, available commercially, to temporarily seal the chimney and avoid air leakage through the flue. Masonry heaters are also known as “Russian,” “Siberian,” and “Finnish” fireplaces. They produce more heat and less pollution than any other wood- or pellet-burning appliance. Masonry heaters include a firebox, a large masonry mass (such as bricks), and long twisting smoke channels that run through the masonry mass. Their fireboxes are lined with firebrick, refractory concrete, or similar materials that can handle temperatures of over 2,000°F (1,093°C). Most are intended for burning wood, but they were historically designed to burn almost any type of solid fuel. The relatively small but intense fire also results in very little air pollution and very little creosote buildup in the chimney. Because most of the heat from the fuel is transferred to the masonry and slowly released into the room over the day, this type of heater does not need to be loaded with fuel as often as other types of wood heating appliances. In addition, if the masonry heater is built where sunlight can directly shine on it in the winter, the heater will absorb the sun’s heat and release it slowly into the room. Chimneys harness the heat of the fire to create what’s called a stack effect. As the warm air from the fire rises, cooler house air rushes into the wood-burning appliance through vents, providing the oxygen the fire needs to burn. Starting a fire with a good hot burn will encourage this healthy draft to flow. Also, between the higher and lower pressure zones of the home lies a neutral pressure zone. The neutral pressure zone tends to move toward the largest air leak. When the top of the chimney is located above the home ceiling (as it should be), the chimney’s neutral pressure zone is above the neutral pressure zone of the house. Such proper chimney placement creates a gentle flow of air into the appliance and out the chimney even when no fire burns. To keep your wood- or pellet-burning system operating efficiently and safely, you’ll need to maintain it on a regular basis. Catalytic combustors need to be inspected after every two cords of wood burned, and replaced according to the manufacturer’s recommendations. Most catalytic stoves or inserts have a place for a thermometer to help you check the combustor. The catalytic cell is removable and replaceable and costs between $75 and $160. Catalysts in new models, especially those made since 2005, should only need changing once every 5–8 years if burning seasoned wood. Older catalytic stoves made prior to 2000 need to be checked more often and catalysts need to be replaced more often. For pellet-fuel appliances, it is very important to follow the manufacturer’s instructions for operation and maintenance. Inspect fans and motors regularly, and maintain them properly. Manufacturers advise removing unused pellets from the stove hopper and feed system at the end of the heating season. This reduces the chance of rusting, which can cause expensive damage to the appliance. It also minimizes difficulties in lighting the appliance at the start of the next heating season. Clean the flue vent on a regular basis to prevent soot buildup. Most pellet fuel appliance dealers either maintain a supply of pellets or recommend a supplier. You may also check the local telephone listings under “Fuel” or “Pellet Fuel,” or inquire at a local tree nursery or at home and garden supply stores.